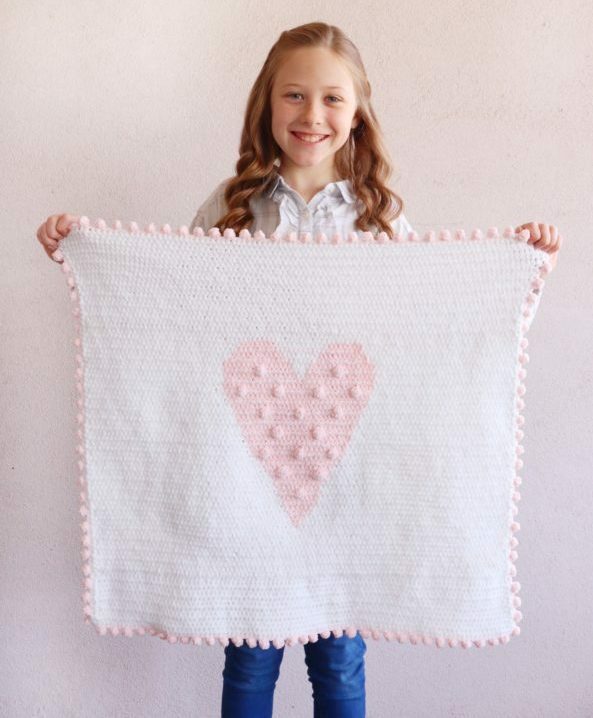 I had so much fun designing my annual heart blanket, especially when I realized my daughter-in-law’s little sister’s birthday was coming up and she has a baby doll she loves to play with! I loved playing dolls when I was little and confession, I loved playing baby dolls with my own girls when they were little! This is Ava, and she received her baby doll for Christmas! I think the blanket fit her baby doll just perfectly. Now let’s get to talking about how in the world I’m going to be able to share with you how I made it. I’ve tried making a graph for you, but in this instance, I can’t get it to work out because I’m not using corner to corner crochet or a typical graphgan type stitch. I am using HDC stitch (half double crochet) but I’m working in between the posts, so a graph doesn’t help me show you where the stitches are. So, I’m very sorry to absolute beginners, this is going to be more of a freestyle type crochet heart, which if you are brave, and have some crochet experience, I hope I can explain it well enough that you can get the heart made in the middle of the blanket. The stitch I’m using is not hard at all to learn, you can watch a demonstration and read about it here in this post. I use this stitch when I use Bernat Blanket Yarn Tiny because it’s very difficult to see where to insert my hook under the top little v’s. It’s just much easier to insert the hook in the larger space in between the posts. Maybe you can zoom in really close to see how the stitches are nestled in between each other to fully understand. The polka dots are double crochets 5 together. If you don’t want to mess with them, you can leave them off and your blanket will look just as amazing because adding them onto the edge is so darling, it really would be just fine. Because, you’re going to have to freestyle the placement of the polka dots too! I’m so sorry! I really was planning on making a simple little graph, but it just didn’t work out. But maybe you’ll forgive me when I show you how I added this adorable border! I think it makes the blanket become a real stunner! Especially with Bernat Blanket Tiny. They are so soft and squishy! Okay, let’s get to the pattern. Row 2 -20: In the first space, to the left of the first HDC of the row below, work one HDC. Work one HDC in each space across ending your last HDC in between the last HDC and the CH 2 space. CH 2 and turn. Row 21: Pull through on the last step of the 50th HDC with Pink. Work stitch number 51 with Pink, pulling the white back through on the last step of the stitch. Work the rest of the row with white. (Do not cut the pink, you’ll pick it back up on the next row. Row 22-49: Going forward each row will increase with pink stitches by one. Pull through with pink one stitch sooner so you can work a HDC on either side of the stitch in the row below. I carried the white yarn through the rows so I could switch and use it on the other side of the heart. But, if you do not like that look, feel free to cut the yarn and work with two balls going forward, one on each side of the heart. Row 50: This is the row where you will find the center of the pink stitches, and switch to one white. Row 52: Increase the middle of the heart with 3 white stitches. 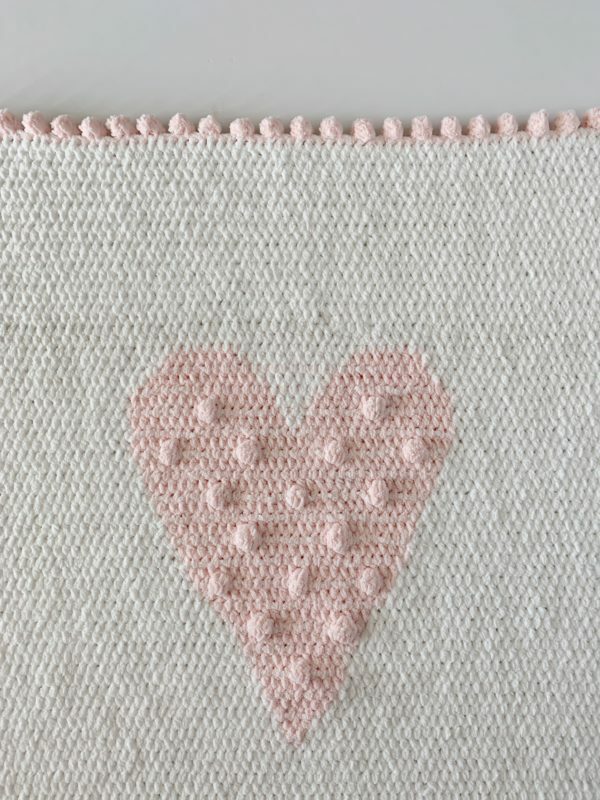 Row 53: Work an extra white stitch when you get to the edge of the pink to start shaping the round part of the heart, then work 4 white in between the two sides, and then eliminate a pink stitch on the other side, replacing with white. Row 54: Decrease again by one with pink on either side of the heart, and add one white in the middle. Row 55-56: Continue decreasing a pink on the sides by one and adding one white in the middle. Row 57- and the next 20 rows, work all white. See video posted above for a demonstration. Do not tie off. CH 1. Work down the side of the blanket working one HDC per row. Work 3 HDC in the corner. Work HDC in between the posts along the base chain row. Work 3 HDC in the corner. Work up the other side one HDC per row. (No need to work across the last row of HDC.) Work 2 HDC and switch to pink yarn by pulling through on the last step of the stitch. Continue in the same direction. *CH 3. Work 5DCtog in the first of the chain spaces. Slip Stitch into the next 3 spaces. Repeat from * around the entire edge of the blanket. Slip stitch to join and tie off. Again, my apologies that I could not give you a graph for the heart. Or, tell you where to place the polka dots. I really think you can do it though! I believe in you! And random polka dots would be cute, but leave them off if you don’t want the stress. Sending you all my love and thanks for following Hannah and I as we crochet along! And thanks to Ava for being my model!